You know I’m a Twitter lover! Now I have even more reason to love this platform after the recent announcement of the Twitter and Google partnership has become public. This deal gives Google access to the almost 9,000 tweets per second (yes that is a real stat) streaming through Twitter’s feed and Google is prepared to add these tweets to their search engine in real time. Meaning: you click ‘tweet’ AND boom it’s searchable outside of Twitter-land in a matter of seconds. What this really means is your social media content will start to play a much bigger role in your SEO. Having a Twitter feed that is fresh, updated often (click here to read my post on how often I recommend), and foundational in regards to your brand, will go a long way toward extending your reach and moving you up in the ever-present battle for search engine list recognition. 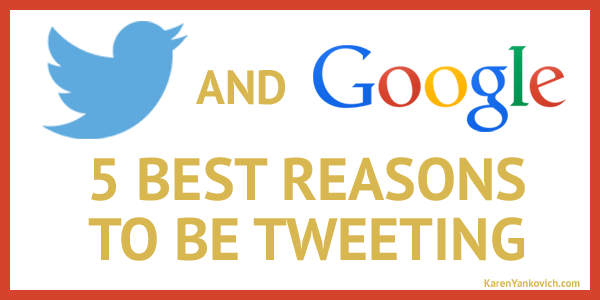 What you need to know and understand about the Twitter and Google partnership. Your Tweets will now be accessible, always and forever. All of them. Now is more important than ever to really think about how your business needs to be perceived, what your focus is and your brand message. The danger of confusing your customer or downright alienating them is even higher. This is due to the fact that a simple creative tweet that used to pass into the 9,000 tweets/second oblivion, now can be found via Google. So that tweet that you really thought had just the right tone to bring you thousands of new followers, but in reality fell flat and failed? Is still there…just waiting to be found. It’s not all about your Twitter followers anymore. The really nice feature of this Google + Twitter partnership is the fact that you will reach your customers more easily who don’t have a Twitter feed. They will get access to your real time marketing, promotions, events and more. And finding ways to get in front of those prospects who are not adept at navigating social media platforms, but love to use the Google, is very much a win in my book. Using Twitter for real-time marketing is more important than ever. Twitter is run by the users. It has launched revolutions, created global trends, and given us access to celebs (of any field) in a way that most of us never would have before. People we wouldn’t have the ability to see in real life, let alone DM via a Twitter chat. Use this to your advantage. Make sure your tweets are current, promotional, and conversational. Join the Twitter party, make an effort to “work the crowd”, and see who else you get to tag along via Google. Using Twitter for foundational branding is more important than ever. Yup this slightly contradicts my above statement, but in reality it is very important that you do both. Because of the fact that your tweets will be accessible via Google, as a business owner you must now be very clear on: your business why, who you serve, and how you help them, now and in the future. Get clarity on that now because what brands your business today may not be how you want to brand it in the future unless you stick with your foundation. Stay focused on those 3 questions and what you tweet about today will still be relevant when someone pulls it up in a search engine list far into the future. Start thinking strategically about your hashtags and word choice. If you don’t already, that is. Hashtags are already a great searchable twitter tool so you should already have a list of best keywords for your business and be using them. But if not, now’s the time to get on it. Hard to say exactly how hashtags will play in the Google SEO, but we know the 140 characters will have much more bang for your buck, so make an effort to choose those words wisely, thoughtfully and with some marketing research to back it up. You know I love Twitter: it’s fast, it’s democratic, its content is not to be underestimated, but only 23% of adults actively use Twitter, so as a platform it has a ways to go to reach Facebook (71%) and still falls short of LinkedIn (28%). The Twitter and Google partnership, changes all that. So what should you do first? Get on Twitter and get ready, today! Need some inspiration on how to best create your tweets? Want to know what your foundational content might actually be? Interested in finding out the best way to use Twitter for your biz? Join my LinkedIn group, (click here!) we can help you with all these questions and more.